Make materials, files and supplies easier to identify. 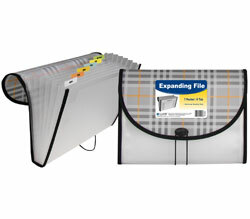 Self-adhesive clear poly pockets let you attach labels to bins, shelves, drawers, cabinets... almost anywhere. Hand write or use a label maker to customize included cardstock inserts. Or print your own on letter-size paper using downloaded templates available at www.c-line.com/template. Simply peel, stick and apply to any clean, flat surface. Holds inserts up to 3-1/2 x 2-3/4. Each pack includes 25 pockets and 25 blank inserts.